Tips on Triggers: Constipation; Can’t Seem to Go #2? Feeling bloated and unable to have a bowel movement, can be a bit uncomfortable. There is no reason to feel embarrassed by digestion issues. There can be several reasons that can cause the body to get stopped up, for example, a bad diet, a change in diet, a crazy schedule, medications or a number of others. Softeners can help the system get back on track, but some people fear what can actually happen, if they’ve never taken the medication before. I recommend calling your doctor when thinking of taking any medication, to see if it is best for you, as an individual. If your not comfortable with medications or they are not for you; the body does have a trigger point for helping with constipation. Feel about 3 inches down from your knee cap. Use that point of reference and move to the outer side of the leg. There is where the trigger point is. Press and hold that spot for 5 seconds and release for double the time, then repeat the hold again. Repeat this process about 10 times. 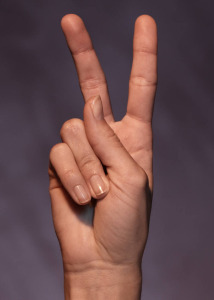 Using this trigger point daily can be a useful aid to many stomach issues and help you keep the peace with going #2. Previous PostPrevent Rusty Tools. Quickie:Next PostHow to get stuck chewing gum out of hair.